Last weekend the Moore household was one of nearly a million homes in the Washington, D.C., area without power. The temperature was between 95 and 105 degrees and it was so humid you felt like you needed gills to breathe. Sure, I explained to my three children, we're miserable, but look at the bright side: Think how much we've reduced our carbon footprint! Consider it a life lesson in what it means to live green. 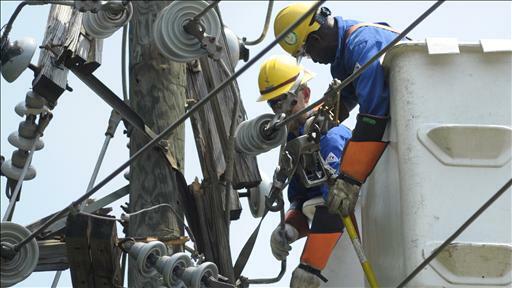 Editorial board member Steve Moore on lessons gleaned from the Washington D.C. blackouts. Photo: Associated Press. That's small solace to youngsters who feel that life without Facebook, World of Warcraft, ESPN, Xbox, cellphones and air conditioning is like losing basic human rights. What, no microwave popcorn? Domino's Pizza isn't coming with a meat-eaters special? Someone call Amnesty International. On Saturday night we all sat on the couch with flickering candle light, sweating and talking. What did people do before the age of electricity?" my 11-year-old asks. "I would have killed myself," he moans. Electrical power is the central nervous system of our modern economy and our 21st-century lifestyles, and living without it for a few days reminds us how vulnerable we are to being sent back to a pre-Industrial Age. Yet every initiative by green groups is focused on reducing our access to electrical power—although they never admit that explicitly. This power outage was caused by a severe thunderstorm from Mother Nature, but I'm convinced that rolling brown outs are coming, thanks to the radical environmental movement that has taken hold of our body politic. Green groups, for example, have declared war on coal, which still produces about 40% of our electricity. The Obama administration is listening and slamming the brakes on coal production. This cheap and domestically abundant energy source is getting cleaner all the time, thanks to technological progress. But that doesn't stop a global-warming alarmists like James Hansen, a lead scientist at NASA, from likening trains carrying coal to the German "death trains" that transported the Jews to Nazi concentration camps. Natural gas is our second major source of electrical energy and thanks to the technological miracle of hydraulic fracturing we have hundreds of years of this clean-burning resource that reduces greenhouse gas emissions. But the Sierra Club is vowing to shut down natural gas too. Just last week North Carolina Gov. Bev Perdue vetoed a fracking bill in the Tar Heel State (overridden on Tuesday thanks only to a state legislator's mistaken vote). She says she's protecting drinking water, but as we've discovered in Virginia, when you lose electricity you often lose access to potable water. Of course, Big Green hates oil and nuclear power too. That's why we're not drilling for oil in many parts of Alaska and on other energy-rich federal lands and waters, and why we're not building the Keystone XL pipeline. This is public policy that is not just anti-growth but dangerous to our health and safety. Sadly, kids are being bombarded in school at a very young age with propaganda that says to save the planet we have a moral obligation to conserve electricity and use "alternative energy." But safe and cheap electricity is what will save the planet from doom. If global warming is a threat, we are not going to be saved by building windmills or riding our bicycles to work, but by using advanced technology and electrical power to find ways to cool the planet. Higher standards of living, huge improvements in health and environmental conditions, and longer life expectancy are the fruits of economic growth that abundant electrical power makes possible. Go to the Internet and call up aerial photos of rich and capitalist South Korea and statist and desperately poor North Korea. South Korea is alive in light, North Koreans live in the dark. Limiting access to cheap electricity is one of the first actions of a successful tyrant. There's one more teachable moment from our three days in the dark. So many Americans—spoon-fed by a "go green" education system and media—live under the delusion that things were better in the past than they are now. Sure the economy is bad, but all we had to do is live for 72 hours without AC, TV, a dishwasher, a hair dryer and Google to appreciate how much progress has been made in the past 20, 30, and 50 years. Today a larger percentage of poor people have access to air conditioning than the average middle-class family did in 1960. For several days the Moore family was powerless. It was awful, but educational. If anything good has come out of this debacle, it is that our household has a new appreciation for how important it is that everyone have access to affordable and reliable sources of energy. The left says we can get our power from "clean, renewable" sources like wind and solar power. After tens of billions in subsidies, these sources provide 3% of our electricity. Anyone who thinks we can power our $15 trillion economy with wind and solar power is living in the dark—or wants the rest of us to as well. Mr. Moore is a member of the Journal's editorial board.